What is Skinceuticals Eye Cream? The area surrounding the eyes is usually where signs of skin aging initially appear. This is due to the delicate nature of the skin in this area. There are several signs of skin aging that can appear including fine lines, dark circles, wrinkles and eye bags. In this article, we will be reviewing a product designed to address aging problems in the eye area. 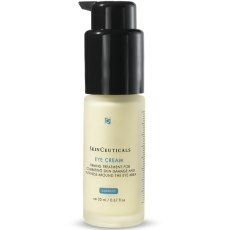 The product is Skinceuticals Eye Cream which is formulated to combat puffiness, dark circles, and sagging skin. It also helps prevent premature skin aging by protecting the skin. Skinceuticals is a relatively new company that started in 1994. Its founding scientist is Sheldon Pinnell, M.D. who researched topical antioxidants which lead to discoveries in the skin care industry according to the company website. The company is not very well known but they offer a range of skincare products including several anti-aging formulations that use patented ingredients. Their skincare philosophy focuses on prevention, protection, and correction. These principles work synergistically for providing healthy and youthful looking skin according to the company website. Skinceuticals Eye Cream Ingredients – Are they Safe & Effective? Water, ethoxydiglycol, cyclopentasiloxane, glycerine, methyl chalcone, hesperidin, dipeptide-2, steareth 20, palmitoyl tetrapeptide-3, cetearylglucoside, cetyl alcohol, tocopheryl acetate, polyurethane, centellaasiatica extract, ceramide 3, sodium hyaluronate, ceramide 1, ceramide 6-11, phytosphingosine, carbomer, cholesterol, xanthan gum, sodium lauroyllactylate, dimethicone, dimenthicone, PEG-100 stearate, glyceryl stearate, C13-14, polyacrylamide, phenoxyethanol, ethylparaben, propylparaben, butylparaben, methylparaben, isobutylparaben, disodium EDTA, juniperuscommunis fruit oil, laureth-7. Support the synthesis of collagen. Combat eye puffiness, skin sagging and dark circles in the delicate area around the eyes. Makes the skin firmer and helps in the healing process. Protect against environmental and stress factors to prevent premature skin aging. How Does Skinceuticals Eye Cream Work? To support collagen synthesis and drastically improve the elasticity of the skin, a special botanical extract from Centellaasiatica is used. This is the active ingredient that diminishes fine lines and reduces skin sagging. Skinceuticals Eye Cream also contains ectoin for protection from environmental factors like extreme cold, heat, etc. This ingredient helps prevent the further development of skin aging signs. To address sagging skin, puffiness and dark circles, the eye cream contains eye-specific peptides. There is no detailed information on the eye-specific peptides which is one of the flaws of the formulation. Apply the eye cream once or twice a day on clean, dry skin. Use your fingertips to apply a small amount of the eye cream underneath and outside the eye area. Avoid contact with your eyebrows and upper eyelids. Massage gently until it is completely absorbed by the skin. What are the Advantages of Skinceuticals Eye Cream? What are the Disadvantages of Skinceuticals Eye Cream? Overall, Skinceuticals Eye Cream is a good eye cream but only for preventing premature skin aging. It contains notable ingredients for protecting the skin. However, it isn’t very effective in diminishing skin aging signs especially wrinkles, dark circles and eye bags. The plain truth is that there are better options on the market if your goal is to address skin aging signs.